First of all let’s start with the good news, because despite earlier misgiving about yet another outing, there is no doubt that the fifth film in the Pirates of The Caribbean franchise is far more coherent than its most recent predecessor. Yes Salazar’s Revenge is way more knowing and far better crafted than On Stranger Tides (2011), but that is not to say that this latest instalment brings anything new or original to the usual seafaring shenanigans. Sadly for its makers, the film is just not entertaining or interesting enough to warrant anyone’s attention beyond its avid fans. Directed by Joaquin Rønning and Espen Sandberg, the film is packed full of the usual gags and, at times, risqué one-liners, but you’d be pressed to find anything resembling Gore Verbinski’s brilliantly nuanced original material in this. In a quest to release his father Will (Orlando Bloom) from the curse of The Flying Dutchman, Henry Turner (Brenton Thwaites) must find Poseidon’s mythical trident in order to break all sea curses and bring the boat and his father to the surface. Along the way, Henry is joined by Carina Smyth (Kaya Scodelario), a young scientist accused of sorcery, and the elusive nautical legend that is Cap’n Jack Sparrow (Johnny Depp). The group is joined by an array of old and new friends and a common enemy, a Spanish navy captain named Salazar (Javier Bardem), who was once condemned to a life amongst the dead by a younger Jack Sparrow. As stories go, Salazar’s Revenge is certainly not the silliest or the weakest in the franchise, there’s also no doubt that the directing team managed to recapture some of Verbinki’s more fun and frivolous aspects of the story to their advantage. However, what makes the whole thing less convincing is the absence of anything resembling an interesting plot or narrative. Brenton Thwaites and Kaya Scodelario do their very best, but are ultimately let down by a screenplay which is simply not worthy of its cast. Depp is back in the Jack Sparrow role which has become an albatross (pun intended) on the neck of a once greatly respected actor. However, by far the best performance comes courtesy of the brilliant Javier Bardem who puts in a truly exhilarating performance as the terrifying Salazar. 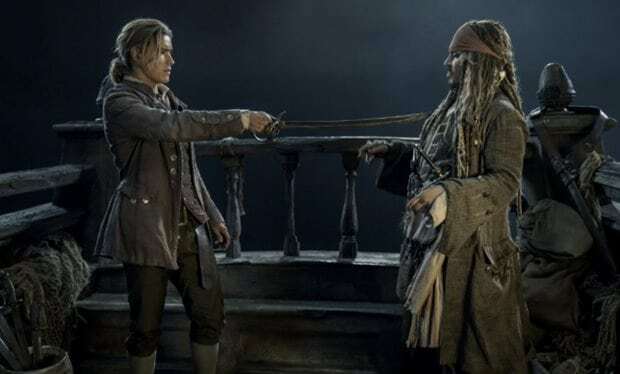 Pirates of The Caribbean: Salazar’s Revenge may not be the most exciting or even the most awaited of this year’s crop of summer blockbusters, but it is a definite return to a more acceptable level of filmmaking. It is also worth noting that at over two hours, the film is just too long for younger viewers and for those who have very little patience when it comes to meandering storylines and endless sword fights. Not entirely terrible, but completely forgettable. Pirates of the Caribbean is in cinemas from Friday 26th May.